Posted on 4/2/2019, 11:52 am, by kittykill, under General Projects. Do you need a little pocket pet that is easy to take care of and won’t destroy your house? A Chickie Nugget is the perfect addition to your menagerie. The Cute Octopus share their tutorial for this adorable little fuzzball that is an excellent filler for Easter baskets. They also make a fun accessory for backpacks, purses and keychains. 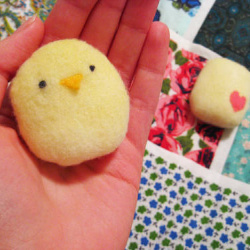 Craft each little chickie in a variety of colors. They are the ideal project for stashbusting. This is such an easy craft that you can make several in one afternoon. Customize each one with embroidery or fun fabric. Crafting should never be stressful! Find the best project for you with our Tutorial Cloud. Happy Tuesday!